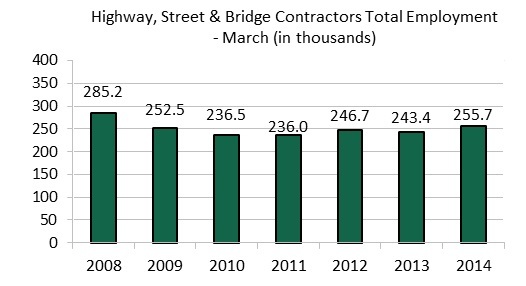 Highway and bridge contractors increased employment by 12,300 jobs in March 2014 compared to March 2013, according to the latest data from the U.S. Bureau of Labor Statistics. Although this is welcome news, employment is still below pre-recession levels of the 296,100 workers employed in March 2007. There were modest job gains in stone mining and quarrying (+1.3%) and the construction sand and gravel mining sectors (+1.3%). Employment was down for ready-mix concrete firms (-1.4%) and construction machinery manufacturing (-1.2%). Employment in the construction industry overall rose to 5.87 million in April 2014 compared to 5.67 million in April 2013. This pushed the construction unemployment rate to 9.4 percent in April 2014, compared to a national rate of 6.3 percent.